Our Redeemers – Minot, ND | Tricorne Audio, Inc.
Situation: The church was undergoing a major renovation of their sanctuary and addition to the building. The existing sound system did not have enough inputs, outputs and flexibility to accommodate the church’s growing needs. As part of the renovation Tricorne Audio, Inc. worked in conjunction with Zerr Berg architects and MBN engineering to design and install a new audio/video system. Solution: The new speaker system was designed using EASE acoustic modeling software. The end result was a single source cluster that included subwoofers and down fill speakers. Keeping all the speakers in one location provided very even distribution of sound throughout the seating area and decreased installation time and cost. The amplifiers and processing electronics were located in a room behind the chancel platform. This provided extra working room in the AV booth and maintained short speaker runs to insure quality sound. Mixing of the inputs is accomplished through a pair of Yamaha LS-9 digital mixers. This combination offers 48 inputs, wired in-ear monitor outputs, platform monitor outputs and complete scene memory storage for the various services and events. Also included in the system is a complete video projection system. This includes (2) 9’x12’ front projection screens with Panasonic 6000 lumen projectors for vivid graphics and backgrounds, even under full light conditions. A smaller screen is located on the back wall for the pastors and musicians to follow along and reference during the service. Extron electronics comprise the headend for easy switching between sources and distribution to all the video locations. 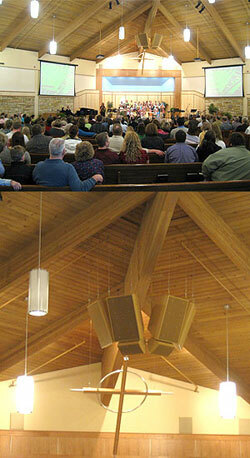 The end result is a very versatile system to meet the current and future needs of the church.